There are many different kinds of heat pumps, but they all operate on the same basic principle of heat transfer. Heat transfer means that rather than burning fuel to create heat, a device moves heat from one place to another. Heat naturally flows downhill, which means that it tends to move from a location with a high temperature to a location with a lower temperature. A heat pump uses a small amount of energy to switch that process into reverse, pulling heat out of a relatively low-temperature area, and pumping it into a higher temperature area. In a heat pump, this heat is transferred from a heat source (e.g. the ground or air) into a heat sink (e.g. your home). One of the most common types of heat pumps is the air-source heat pump, which takes heat from the air outside your home and pumps it inside through refrigerant-filled coils. Inside this basic heat pump, you'll find two fans, refrigerator coils, a reversing valve and a compressor. This system is more commonly known as an air-air heat pump, because it takes heat from outdoor air and transfers it to indoor air ducts. With the proper modification, air-source systems can also work with other types of indoor heating systems. The reversing valve is a very versatile part of a heat pump. It reverses the flow of the refrigerant, so that the system begins to operate in the opposite direction. Instead of pumping heat inside your home, the heat pump releases it, just like an air conditioner. The refrigerant now absorbs heat on the indoor side of the unit and flows to the outside, where the heat is released and the refrigerant cools and flows back indoors to pick up more heat. As we discussed in the previous section, air-source heat pumps use a fan in an outdoor unit to bring air over refrigerant-filled coils. Two sets of these coils transfer heat indoors, where the heat is blown away from the coils by another fan and distributed through a home. Some air-source heat pump systems consist of a single "packaged" unit containing both sets of coils in one box. This box is then installed on the roof of a building with the ductwork extending through the wall. Larger systems for commercial buildings often are installed in this way. Home heat pumps are usually "split" systems with an outdoor and indoor component installed through the wall. Depending on the type of system, there may be one or more indoor components to distribute heat. Ground-source heat pumps absorb heat from the ground or an underground body of water and transfer it indoors, or vice versa. The most common type of ground-source heat pump transfers heat directly from the ground by absorbing it through buried pipes filled with water or a refrigerant. Ground-source heat pumps that pump liquid through pipes can be either closed-loop or open-loop systems. In a closed-loop system, the same refrigerant or water circulates through the pipes repeatedly. In an open-loop system, water is pumped out of the water source, such as a well or a man-made lake, and when the heat has been extracted from the water, that water returns to the well or surface lake. More water is then pumped from the well to extract more heat. Absorption heat pumps are air-source heat pumps that are powered by natural gas, solar power, propane, or geothermally heated water rather than by electricity. Absorption pumps can be used for large-scale applications, but are now available for large homes as well. The main difference between a standard air-source heat pump and an absorption pump is that rather than compressing a refrigerant, an absorption pump absorbs ammonia into water, and then a low-power pump pressurizes it. The heat source then boils the ammonia out of the water, and the process starts over. Manufacturers rate absorption heat pumps differently from standard heat pumps, using a measurement called a coefficient of performance (COP). Consumers should look for a COP above 1.2 for heating and above 0.7 for cooling. (We'll discuss ratings for standard heat pumps a little later.) Air-source, ground-source, and absorption heat pumps are the most common kinds of heat pumps, but they won't work in every situation. Read on to learn about special kinds of heat pumps. A heat pump is a device that uses a small amount of energy to move heat from one location to another. Heat pumps are usually used to pull heat out of the air or ground to heat a home or office building, or they can be switched into reverse to cool a building. If you know how an air conditioner works, you already know a lot about how a heat pump works, because heat pumps and air conditioners operate in very similar ways. Heat pumps are a unique kind of heating system, because they can do the work of both a furnace and an air conditioner. Thus, there's no need to install separate systems to heat and cool your home. 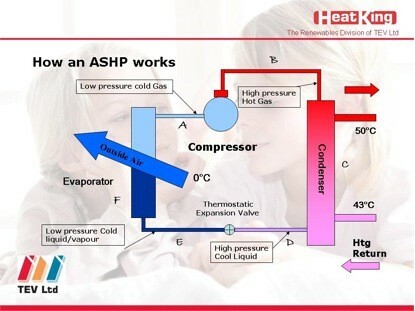 Heat pumps can also work extremely efficiently, because they simply transfer heat, rather than burn fuel to create it. Heat pumps work best in moderate climates. If you live in a moderate climate, using a heat pump instead of a furnace and air conditioner may help you save money on your utility bill. Most heat pumps are somewhat limited by the cold, however, so it is important that you learn which kind of heat pump is best for your area before installing one in your home or office building. If you install the wrong kind of heat pump, you may end up paying even more in energy costs than you do already. Copyright © 2006-2009 Allendale Heating Company, Inc.